My friends, Paula, Hunter, and Rachel were able to have dinner twice here during Paula & Hunter’s three week trip. The first time was during their first week there, before I arrived at Disney World on 3/24/17. I was planning to join them for Round 2 on 3/29 but my cold was bad enough at that point that I decided I needed to stick close to my room at the Polynesian that night. 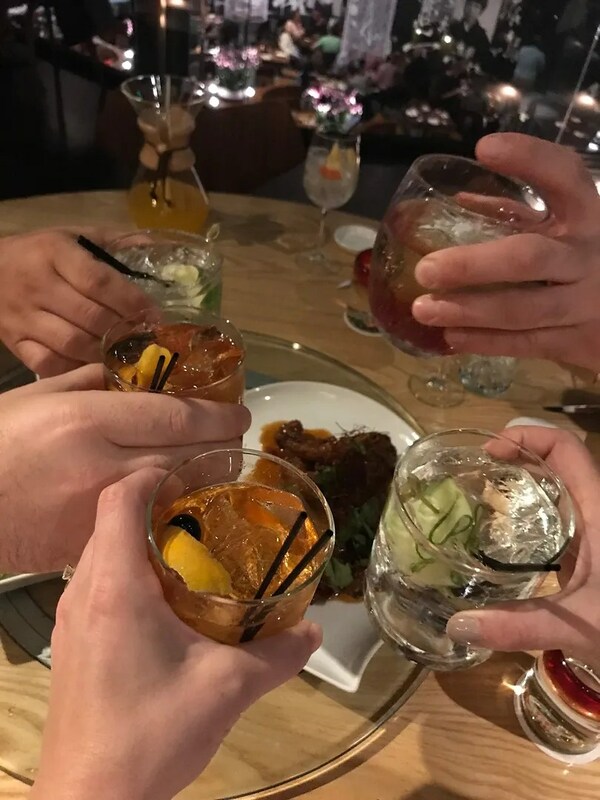 Thankfully though my friends had me covered, as they photographed and reviewed their food from both of their dinners at Morimoto’s. 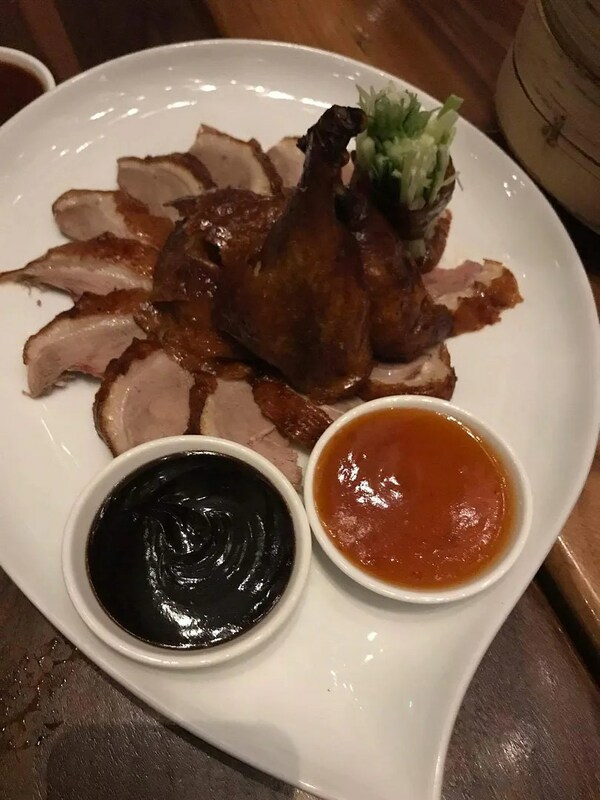 Here is what the three of them had during their first dinner there, which I believe was on Oct. 18th. 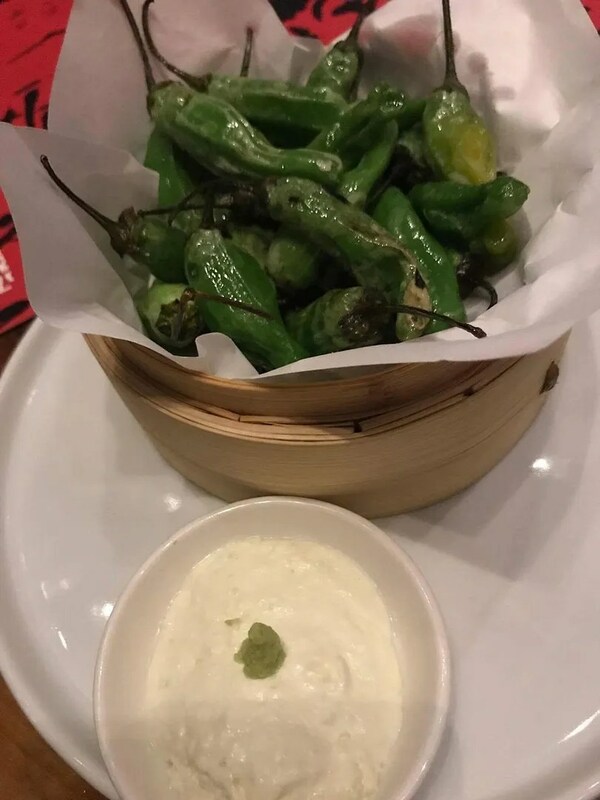 These were Blistered Shishito Peppers served with wasabi crème fraiche. 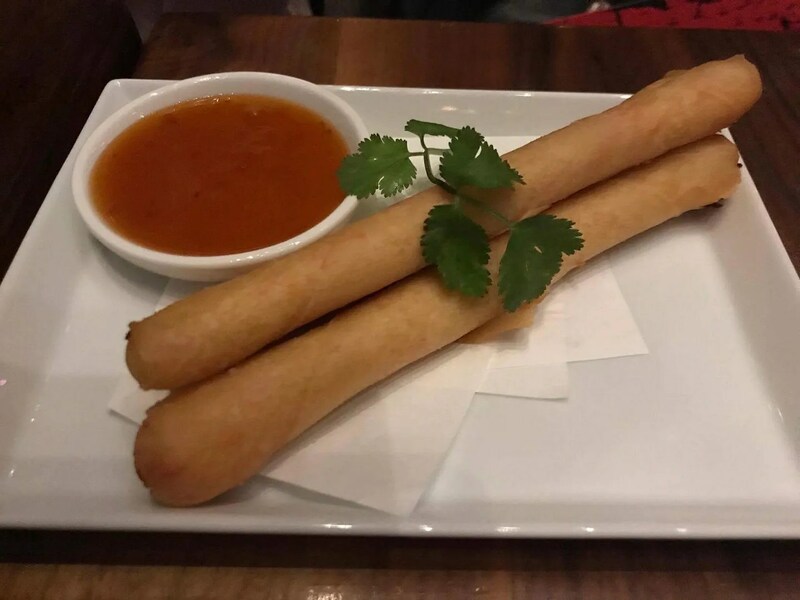 Though at the time these weren’t listed on their menu, they now appear in the “Small Plates” section. 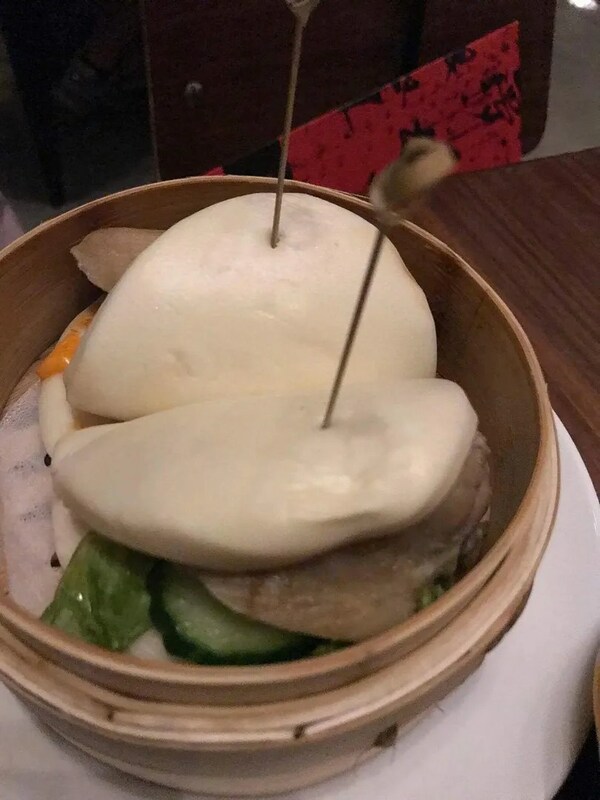 So it seems that they were testing these out with guests (serving them as a complimentary amuse bouche) and the test must have been successful. I asked if these were spicy and Hunter said they were pretty tame. 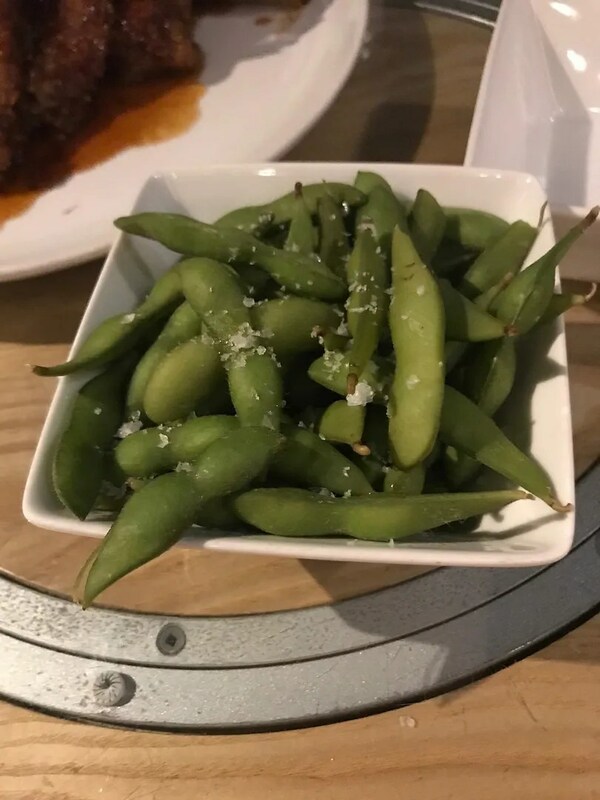 He described them as being “blistered” in hot oil and topped with yuzu salt (a mix of salt and yuzu, which is an Asian citrus fruit). Since crab is spelled with a “k” I assume they use imitation crab meat in these. But regardless of whether they have real or imitation crab, Paula and Rachel both thought these needed more cream cheese. 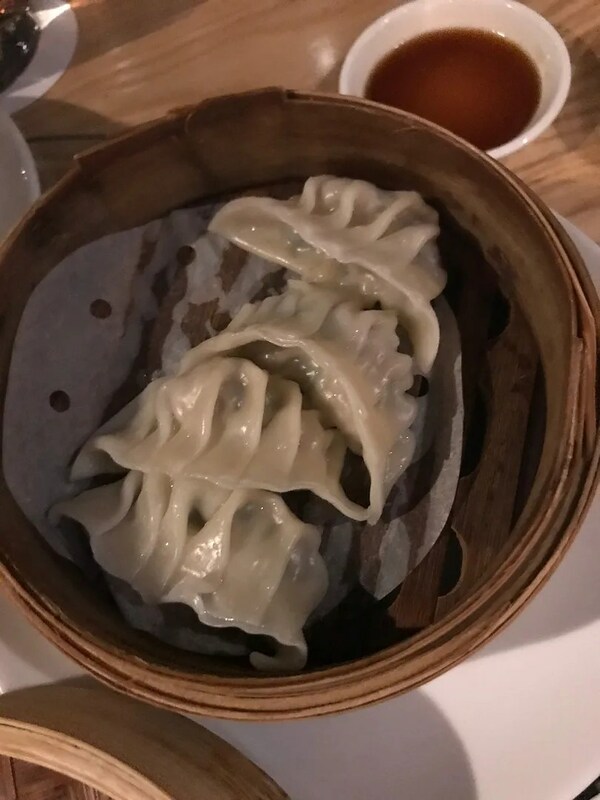 The “Krab” Rangoon ended up being the one thing they didn’t like at their Morimoto dinners. 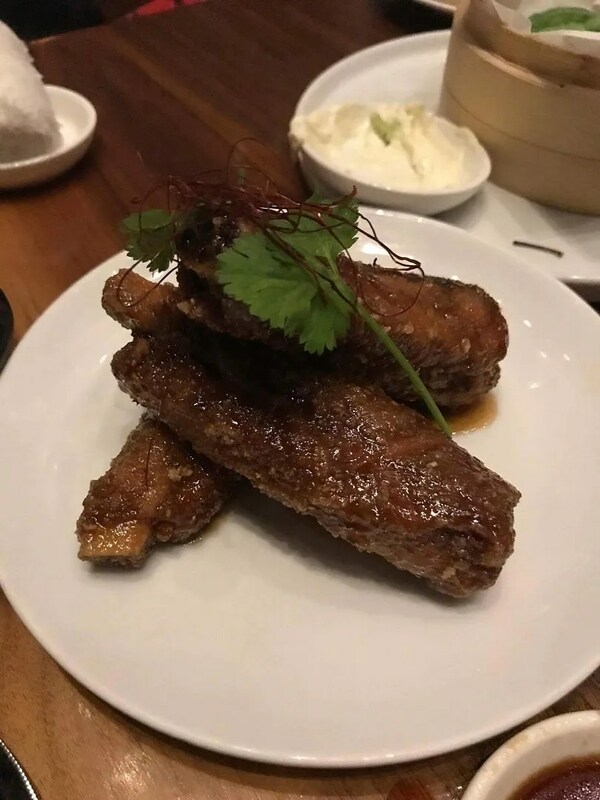 These were all so good that they ordered all three again when they returned for a second dinner at Morimoto’s. 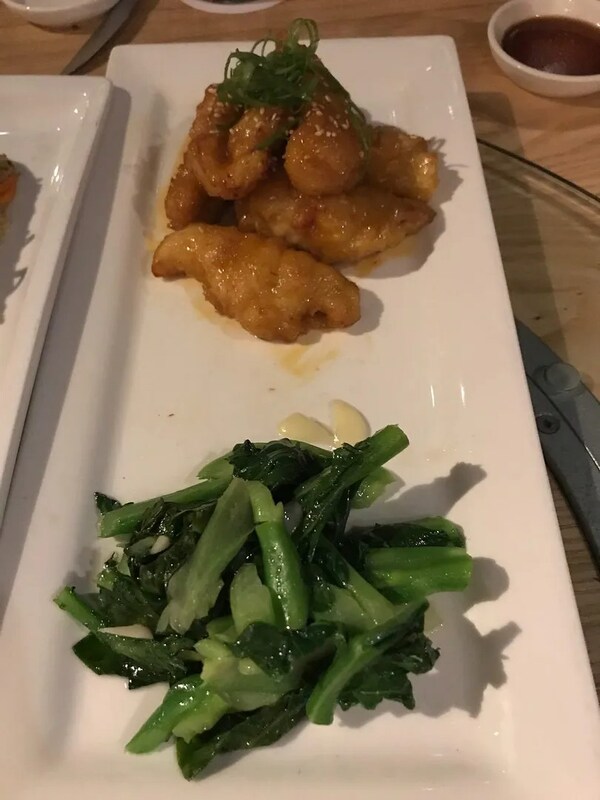 They enjoyed both of these very much, so much that they ordered both again during their second dinner. And speaking of their second dinner, this time Paula, Hunter and Rachel were joined by two Disney World Chef friends, Chef Phillip Ponticelli and Chef Eddie Mendoza. So more people meant more food! 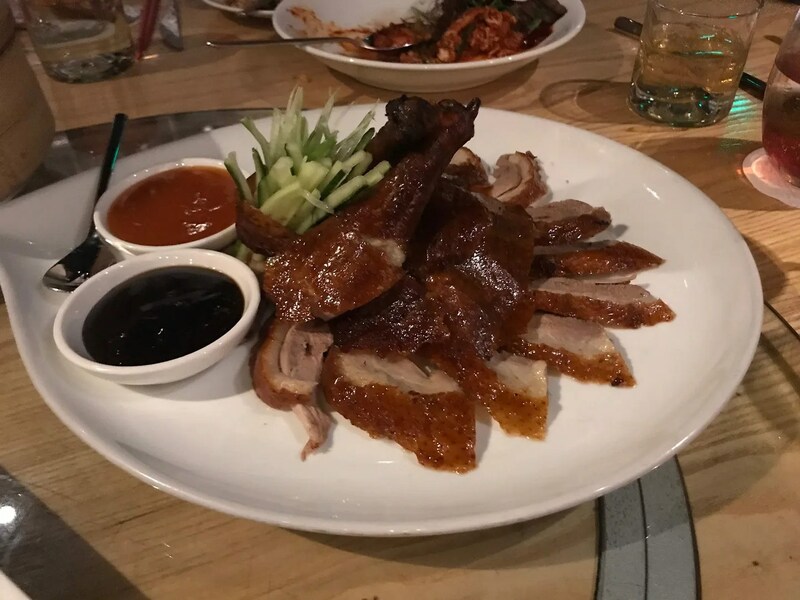 …and Peking Duck Duck again. So that just leaves the Ratings & Rankings. 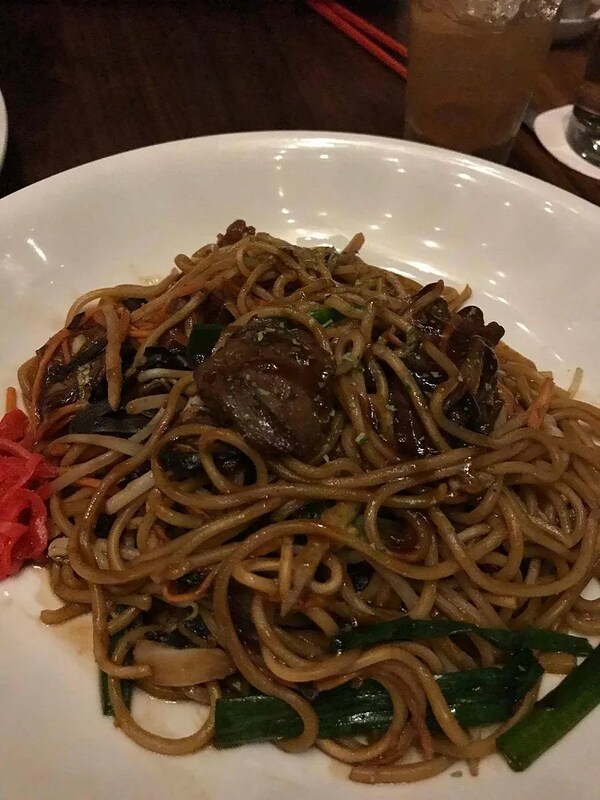 My friends would rate their two Morimoto meals at least 4 1/2 stars. But much to my surprise, Morimoto Asia only received a rating of 3 1/2 stars from Yelp reviewers. 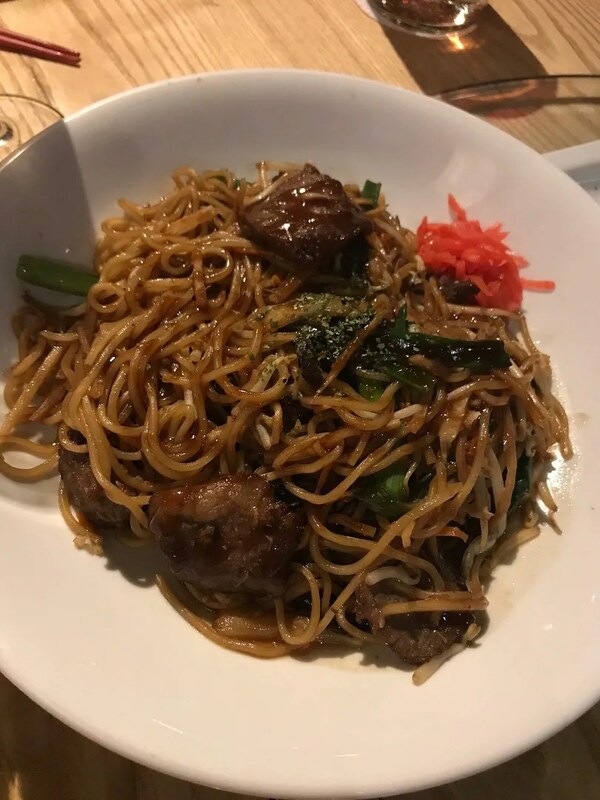 They did a little better on Trip Advisor, with a 4 star rating but have a relatively low ranking (compared to many other Disney World restaurants) of #422 of the roughly 3,000 Orlando area restaurants reviewed there. Also, narrowing it down to just the restaurants in the Disney World area, it ranked only #127 of about 300. 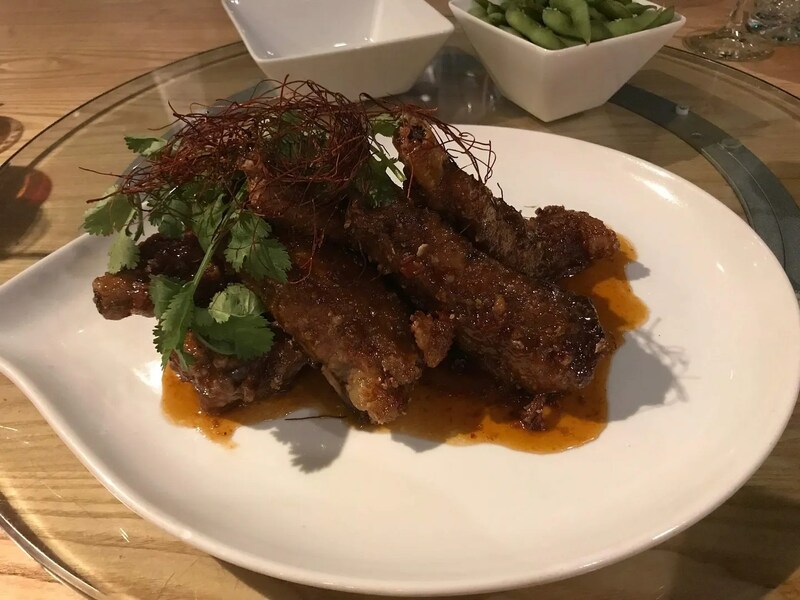 Oddly enough, Nine Dragons, the Chinese restaurant at Epcot ranked higher on Trip Advisor, coming in at #111 for Disney World and #373 for Orlando. If Paula and Hunter are reading this review, they are probably laughing now…an incredulous laugh! Why?? 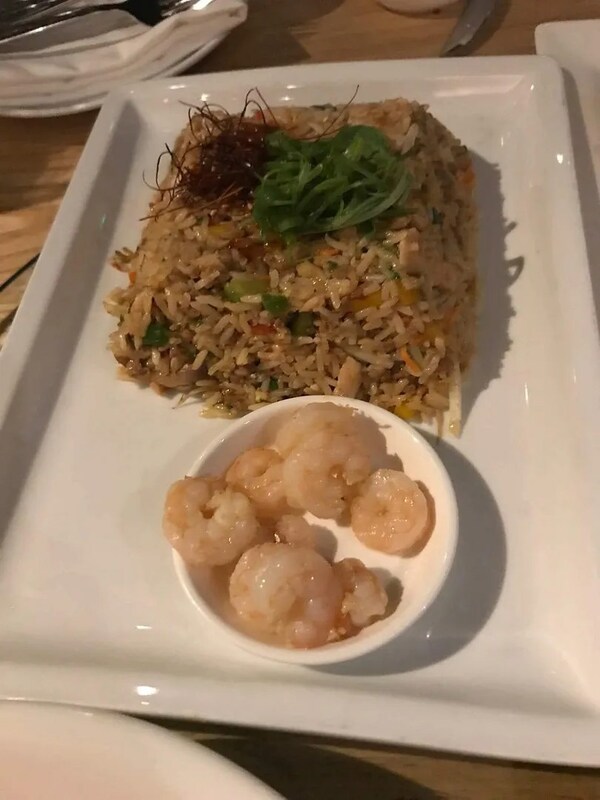 Because they also tried Nine Dragons for the first time during the first week of their trip (before I was there) and they said their meal was awful. Go figure?? ?